SQDR 4.50, released in April 2015, is a major revision, using a new internal architecture while retaining the familiar easy-to-use Data Replicator Manager interface. In addition, SQDR is now available as a 64-bit application, and can use either IBM DB2 for LUW or Microsoft SQL Server for its control database, simplifying installation when SQDR and SQDR Plus are installed together to enable incremental replication. The technical document describes issues related to upgrading to SQDR 4.5 and later from earlier versions of SQDR. SQDR 4.1x and earlier was distributed as a 32-bit application, though frequently it was installed on 64-bit operating systems such as Windows Server 2008R2 and 2012. Customers have the choice of continuing to use the 32-bit version of SQDR on a 64-bit operating system; however, we recommend upgrading to the 64-bit of SQDR to take advantage of enhanced performance and to be prepared for future upgrades. In addition, SQDR Plus (used for incremental replication) is available only as a 64-bit application, and is bundled with the 64-bit version of SQDR; if you are installing SQDR and SQDR Plus on the same system (the typical scenario for an incremental replication scenario), you can used the combined installer to simplify installing and updating both products. See Upgrading to 64-bit SQDR for details. If you choose to not update to 64-bit SQDR at this time, you can continue to use the 32-bit version of SQDR by using the 32-bit installer for SQDR, available by request from StarQuest support. Run both SQDR and SQDR Plus installers to upgrade both components to 4.5. After updating SQDR, be sure to run Data Replicator Configuration to upgrade the control database. 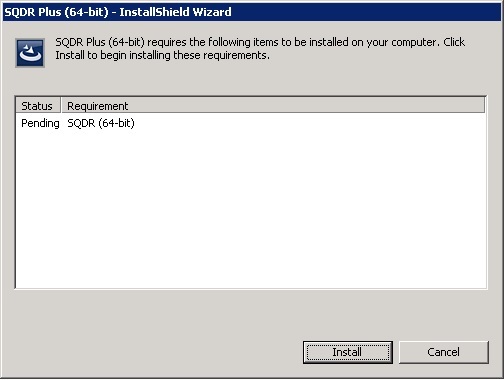 The following dialog will appear; click Install, even though you do not wish to install 64-bit SQDR. The SQDR installer installs or updates StarSQL if StarSQL is not present or already installed at v6.1 or later. If a version of StarSQL prior to v6.1 is present, StarSQL is not updated. We recommend uninstalling older versions (pre-6.1) of StarSQL prior to installing SQDR so that you will automatically receive updates to StarSQL when SQDR is updated. If you are currently using a version of StarSQL earlier than 6.19, you will need to rebind StarSQL packages on the host computer; see Binding StarSQL Packages Using StarAdmin. If you are using SQDR Plus for incremental replications, there is no need to use the standalone StarAdmin installer; StarAdmin can be found in the Tools subdirectory of the SQDR Plus program group. You must run Data Replicator Configuration to update your existing control database to the 4.5 format; either select the checkbox to run the Configuration on the final screen of the installation wizard, or select Data Replicator Configuration from the Program Group, and choose "Use an existing control database and tables". If you are upgrading from SQDR 3.x, you must first upgrade the control database to the 4.02 format, and then use the Data Replicator Configuration to update it to the 4.5 format (as described above). To do this, you can either install SQDR 4.1x as an intermediate step and run Data Replicator Configuration, or execute the SQL script updatedb.sql from SQL Server Studio or using osql or SqlCmd after specifying the target database with USE ControlDB (where ControlDB is the name of your control database). Use SQL Server 2008 or later (SQL Server 2008R2 or later recommended) or IBM DB2 for LUW 10.1 or 10.5 (10.5 recommended) for the SQDR control database; SQL Server 2000 and 2005 are no long supported for use as the SQDR control database, though they can still be used as source and destination databases. Be sure to use a SQL Server Native ODBC driver (or "ODBC Driver 11 for SQL Server") rather than the older "SQL Server" ODBC driver for the SQDR control database and SQL Server sources and destinations. We recommend using the latest SQL Server Native driver (currently SQL Server Native 11), with the exception of source and destination connections to SQL Server 2000, which require SQL Server Native 10. You can install multiple versions of SQL Server Native client on the same machine. A highlight of the new features is the ability to use IBM DB2 for LUW in place of Microsoft SQL Server for the control database; this simplifies installation for incremental replication scenarios, as DB2 for LUW is already present for use by SQDR Plus.To convert an existing SQL Server control database to DB2 for LUW, see Migrating SQDR control database from SQL Server to DB2 LUW. Windows Server 2003, Windows XP, Windows Vista, and Windows 2008 (non-R2) are no longer supported. Issue: SQDR must be able to connect to both source and destination systems on startup after an update to 4.50 to determine the database type; this information is added to the control database. If SQDR is unable to connect to the source or destination database due to invalid or expired passwords or temporary connectivity issues, you may encounter undesired behavior after correcting the password or connectivity issues. For instance, a snapshot replication to a SQL Server destination that required a password change encountered ODBC syntax errors when creating keys, slower performance, and destination database options were unavailable in Data Replicator Manager.